But what about at night? Where does the relationship between dog and owner separate? 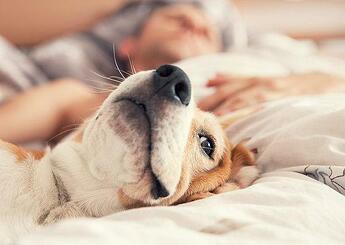 The research is split on whether letting your dog sleep in bed with you is a good idea. On the negative side, a rare spread of disease by the dog to human can occur. It can even enhance one’s allergies. But the positives date back to Aboriginal Australians who slept beside their dogs or dingoes for "warmth and protection from evil spirits." According to American Kennel Club (AKC), less than one-half of all pet owners share their bed or bedroom even with their pet. Co-sleeping with your dog was featured in Human Nature in a study that found sharing space with your dog compares to co-sleeping with a child. Before bringing your dog into the bedroom, there are several questions to ask yourself. Are you a light sleeper? Dogs are polyphasic sleepers and average three sleep/wake cycles per night whereas humans are monophasic sleepers (one period of sleep over a 24-hour cycle). If disturbance is a normal issue outside of a dog in the bedroom, co-sleeping may not be for you. Do you startle easy? While sleeping, dogs stay alert for sounds which make them lighter sleepers than their humans. This could mean a bark in the middle of the night or growl. Will you stay in one position? Owners of tiny dogs need to think seriously about co-sleeping if they are heavy sleepers and move a lot at night. A tragic crushing or smothering of the dog would be traumatic for the owner. Are you or your dog sick? If you are already sharing a bed with your dog, make certain it is when you are both healthy. The last thing you want is an accident in your bed. Are you single? Two people in a bed can already be disruptive enough especially if you are newlyweds so make certain you want to add a third entity. Intimacy may be affected as well if you lock your pup out during a romantic evening. Be prepared for scratching or crying at a closed door. Do you leave your dog at home during the day? If the answer is no, you may want to reconsider sharing a bedroom. Your dog could develop separation anxiety if you are always together. How committed are you? Maybe you decide from day one your little puppy will be sharing your comfortable, warm bed. The first few nights cuddling up to you will make it harder to transition your pup out of the bed. Think first before you commit; the transition will be very hard getting your pup into a new routine. Let’s say you answered these questions with flying colors and are ready to invite your dog or puppy into bed. Because dogs are submissive to their owner, it may be easy to bring your dog to bed if it is smaller and stays by your feet. Dogs are like a shadow to their owners and the feet are a representative spot for dogs to stand watch over their human. If you are lucky, you may be able to continue co-sleeping if your dog is at the foot of the bed. There are many additional benefits to co-sleeping according to American Pet Products Association (APPA). The reason many people, especially singles, adopt a dog in the first place is for safety. With a dog by your side, you are not alone and feel comforted. Warmth. Any cuddlebugs know on a cold night snuggling up with a partner or pet provides an increase in body temperature. And with dogs, they are about 3-6 degree warmer compared to humans. Think of your dog as a portable electric blanket. A report in Sleep Review found the rhythmic breathing of their dog helped with insomnia. The presence of a dog in the life of an individual going through a stressful time promotes comfort and safety. This translates into insomnia cases as well. For many, the unconditional love of a dog helps patients with mild cases of depression to the point that their pet stays by their side at all times in the house including the bedroom. A consistent presence of affection from a dog is sometimes a good starting point for those dealing with depression symptoms. The emotional bond between a dog and their human can be inseparable. If a child in the house becomes the co-sleeper, they normally will be the favorite child as the dog feels safe and comforted in their presence. Same goes for any co-sleeper. There are a few tips and tricks to sleeping with your dog permanently by your side. And if it does not work, a crate or bed on the floor may do the trick to keep your bond but get more room in bed. Invest in a mattress that doesn’t bounce too much when changing positions. This can ensure more sleep from you if your dog is restless. Establish a routine. 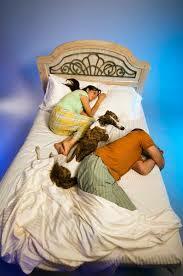 Make certain your dog understands the bedroom is for sleeping especially the bed itself if co-sleeping. Do not engage in play. If your dog wakes up at night and tries to nudge you awake, resist playing or engaging. This can throw off their sleep schedule and may become a common occurrence where submissiveness is the owner versus the dog. Stay consistent. Do not sleep with your pet one night and then lock them in a crate in the kitchen the next. Their sleep patterns will adjust to yours if you start day one with the routine you prefer. Think about a crate or a bed. Depending on the size of your pet, maybe you need the bed itself but want your dog close by. A crate next to your bed could do the trick if you are trying to wean your dog from the bed. A special bed or pillow can help as well. Whether you are for or against co-sleeping in the bed or in the bedroom, dogs still need 12 to 14 hours of sleep per day with puppies sleeping 20 hours per day on average. Though it all depends on the breed and size, only 10 percent of a dog’s sleep is in REM unlike humans where 25 percent of sleep is REM. Hopefully these tips can help you determine the best option for you as a dog owner. However, there is still always a chance your sleep disruptions are truly insomnia or sleep apnea. Our sleep specialists at The Alaska Sleep Clinic can talk for free to get you back on track for a full night’s rest.